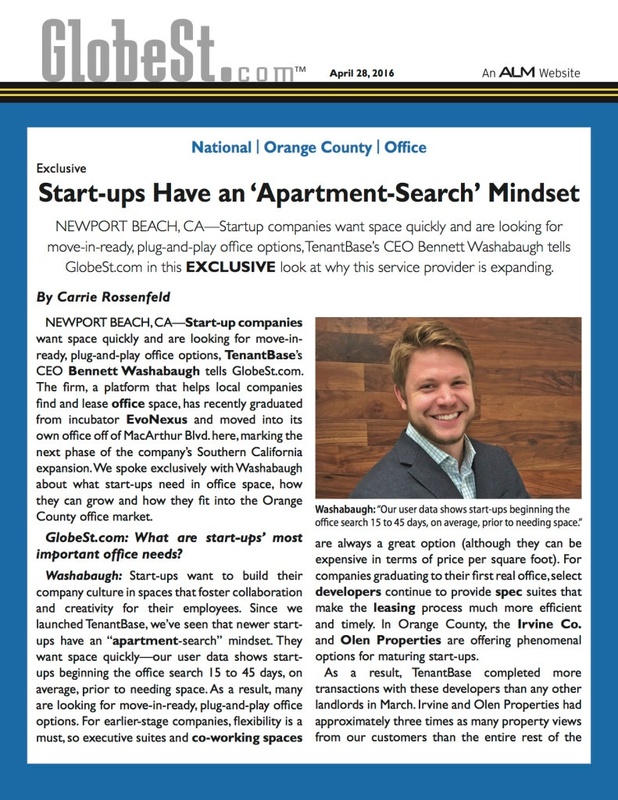 GlobeSt | How do Startups Search for Office Space? 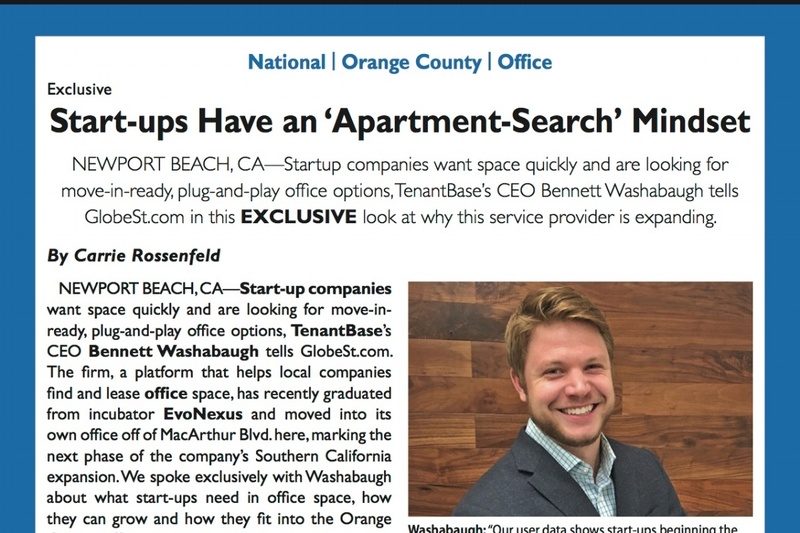 TenantBase CEO Bennett Washabaugh discussed trends in startup and small business office search with Carrie Rossenfeld, reporter at GlobeSt.com. Here are some main takeaways from the article. New businesses searching for office space have never leased an office before! Unlike older, larger, more established companies, they don't have experience leasing multiple offices over a long period of time. Many are beginning their search 15-45 days prior to needing to a space, according to our data. This means finding a move-in-ready, plug-and-play option, but it also means that startups may need some help understanding the market and negotiating points when signing a lease. That's why TenantBase's office search technology is supported by a team of commercial real estate experts that help each tenant along the discovery and leasing process. ....and need space based on stage of growth! We find that companies 0-2 years old are often interested in co-working spaces and executive suites. TenantBase itself just graduated from prominent Southern California incubator EvoNexus! Some buildings also offer spec suites, which maturing startups tend to prefer. 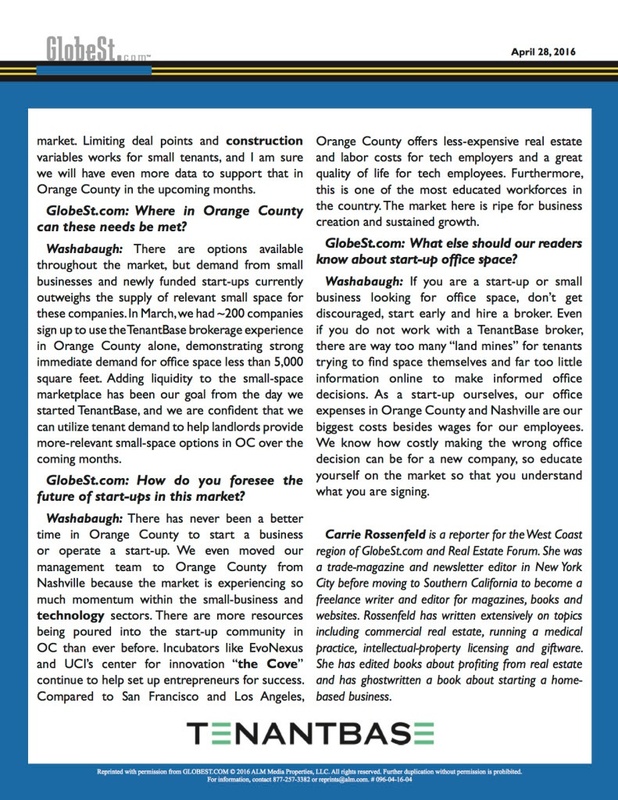 Here in Orange County, notable developers such as the Irvine Company provide excellent options for growing businesses. Bennett's advice for startups looking for office space? Don't get discouraged, start early, and hire a broker. There are so many potential additional costs and unpredictable obstacles when leasing an office. Whether you're a new business owner or a veteran entrepreneur, it is important to speak with an expert that knows and understands your surrounding office space marketplace intimately. Thank you to Carrie Rossenfeld and GlobeSt.com for the wonderful feature. Read it here! TenantBase is a free search platform and service available to startups, small businesses, and local entrepreneurs looking for office space.